This month we are taking the photo time machine back to 1986 at Lehigh; a gallon of gas was $.89, "Top Gun" and "Stand By Me" premiered in theaters , the Chicago Bears won the Super Bowl, Lionel Richie and Mr. Mister were all over the radio, the Space Shuttle Challenger exploded, Mike Tyson became the youngest heavyweight champion in history and Ronald Reagan was into his second term as President. ...but where were YOU that year? If your memory is having trouble re-booting, maybe this two-page spread from the 1986 edition of Epitome will help you locate some of those lost files. 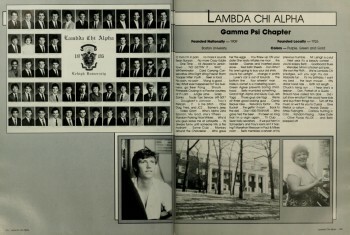 We're sure that Gamma Psi had some fun that year!